King Ludwig II of Bavaria has called all great architects to design his greatest achievement: a world-renowned palace. Only the best will do! Gorgeous appointments, white stone, surrounded by water, with swans everywhere. Oh, and the Ludwig touch? All the architects must design the palace together. The designer who shows the strongest influence will receive the order to build it. In The Palace of Mad King Ludwig, each player builds rooms one at a time in a single gigantic palace. As rooms are completed, a moat slowly forms around the outside. Once the ends of the moat connect, the palace is finished! Arrange and complete different room types, while leveraging clever placement of swans. The player who contributes the most to the palace wins the game! 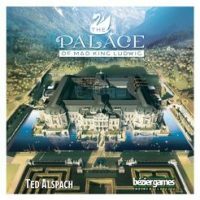 Add a Review for "Palace of Mad King Ludwig"